The chart types are also suggested by intellisense, note that some of them don’t support -ShowPercent or ‑ShowCategory options and “bad” combinations will result in an error on opening Excel. Re-creating existing Pivot charts can cause an error as well. In this example I use an existing session with a database – the online help shows you how to use different connection strings with ODBC or the SQL Server native client. Set-Format -WorkSheet $ws -Range "F2:G50" -NumberFormat "0.0%"
The set-Column command supports range naming, and both commands support formatting – or we can use the ‑PassThru switch and pipe the results of setting the column into Set-Format. There seems to be a bug in the underlying library where applying number formatting to column after formatting a row applies the same formatting to the column and to the row from the previous operation. So, the example above uses a third way to apply the format which is to specify the range of cells in Set-Format. Finally we can output this data, and make use of the names given to the newly added columns in a new chart. 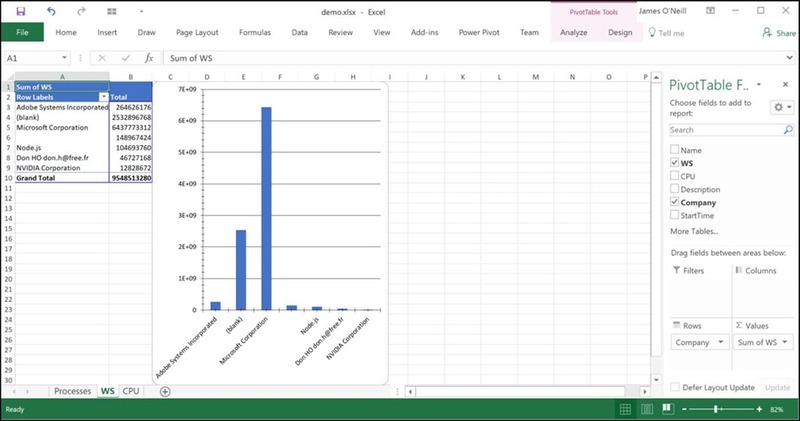 So there you have it; PowerShell objects or SQL data goes in – possibly over multiple sheets; headings and filters get added, panes arranged: extra calculated rows and columns are inserted , and formatting applied, pivot tables and charts inserted – and if Excel itself is available you can export them. No doubt someone will ask before too long if I get the the charts out of Excel and into PowerPoint slides ready for a management meeting … And since the all of this only works with XLSX files, not legacy XLS ones there might me another post soon about reading those files.